For anyone watching the skies, you might have noticed that a familiar superhero logo recently came to town. That’s right, the Leadpages engineers recently rolled out the Facebook Ads Builder. Leadpages is the only landing page builder (in the world!) 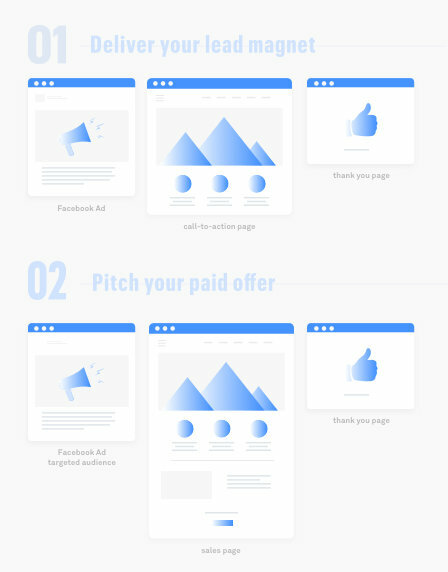 partnered with (the) Facebook to bring you a simplified Facebook Ad Builder experience that allows marketers to publish and promote ad campaigns in just a few minutes. Since this new feature launch, we’ve been helping lots of small business marketers overcome their overwhelm and frustration to launch successful Facebook ad campaigns. Like Jenny, who improved her conversion rate by 10x! We’ve also received lots of questions, regarding our Facebook Ad Builder and Facebook marketing in general. So (ta-da!) we’re whipping up a 10-part series to dive deep into the Top 10 Facebook Ad FAQs we hear from our customers. This is the first of that fabulous series. 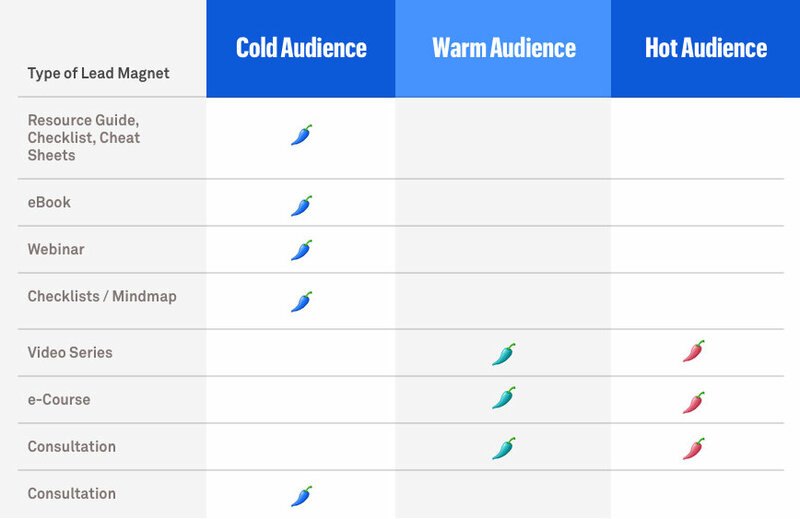 What are the most effective lead magnets for Facebook ads? Before we dig into the tactical game plan of identifying and building effective lead magnets for Facebook ad campaigns, let’s make sure we can all agree about the strategies that are going to keep us on track to our goals. What is a Facebook ad lead magnet? By offering a lead magnet, content upgrade, webinar, email mini-course, or similar resource, you’ll effectively showing your potential leads the exact value they can get from you – and wheting their appetites so they’re more likely to bite in for a richer dish in round 2. Below is a sample from a recent Facebook ad lead generation campaign we ran here at Leadpages. Our Facebook ad sets promoted a free webinar, inviting attendees to learn how to launch a lead generation campaign in under 5 minutes. Jump the barrier, and then some. Your content freebie has to be appealing enough for your prospect to give away his or her email address (and maybe, a first, and last name). That’s the barrier you have to jump over. Depending on your level of email feng shui, you might consider that a low threshold (AKA, you’re an email hoarder) or a fairly high barrier (inbox minimalist). Either way, securing an email address (lead gen.) is a hurdle you must clear, while winning their trust & engagement is the hurdle you should clear. That is why we recommend you forget your need for leads and focus on what you can give to your audience that will deliver extraordinarily high, unexpected value. This requires a giving mindset (there’s a magnetic pull to generosity!) – and if you can successfully make the switch (from a scarcity mentality), then you can dramatically increase the opt-ins for your email list. We want to make sure that if someone clicks through your Facebook ad, you’re able to give them something of value. Heads-up here, folks! This means prioritizing what they want OVER what you want to deliver them. If you’re focused on a specific channel (“oooo la la, Facebook Ads looks like fun!”) or format (“Dude…. .GIFs are so groovy right now”) then you’re coming at it all backwards. Get customer-centric: clarify their key needs and critical questions, find a way to fill the gap, and choose channels and content format that fit your customers’ needs. If your traffic is clicking through the ad to a landing page, you want to get them excited about more than just your free giveaway offer: you want them to be excited about you & your for-sale services/ products. BUT you also want to have a lead magnet that gets people to want to buy from you in the future. This is where your marketing funnel comes into play. Afterall, you are (most likely) not in business just to do lead generation. You’re drip-feeding content so that you can walk prospects and leads through a process of “knowing, liking, and trusting you” but also priming them to purchase increasingly higher-ticket items. In this way, you’re effectively starting with the end in mind: when you combine a high-quality opt-in offer with effective follow-up communication, you can guide people further into the funnel. The answer is that regardless of the platform, it’s about the people. What makes Facebook Ad campaigns a uniquely powerful lead generation opportunity is that you can target your audience with unparalleled precision – and that makes all the difference (and I’ll explain why). Lead generation campaigns are necessarily forays into the wilderness of cold traffic…AKA, targeted strangers who may not be familiar with you, your business, or the value you can provide. That means we’re cold calling…via Facebook Ads. 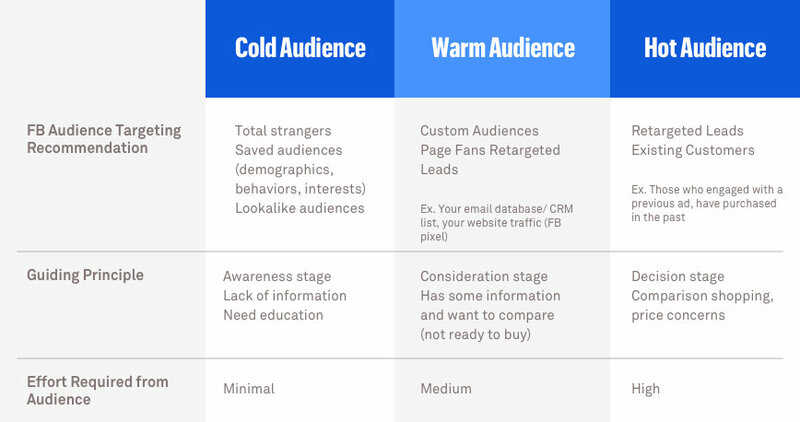 Maximize your success by aligning the temperature of your audience (cold leads vs. warm leads) to the type of lead magnet you offer. One common mistake small business marketers make is torturing themselves to create a monster opt-in offer (AKA lead magnet) such as an e-Course, video training master class, etc. And while these are excellent forms of content, they don’t convert all that well to cold traffic. Confused about some of those audience targeting terms? Check out Facebook’s audience targeting resources at their Advertiser Help Center. Cross-pollinate your content with colleagues! Work together with your colleagues to promote each other’s lead magnets. For example, if you know someone who targets the same/ similar audience to yours, try including a Leadbox with their lead magnet on your thank you page. Set up this swap with a trusted colleague and your audiences can benefit from double the content and you get double the exposure! Does this provide a high degree of value to my target audience? Do the content and format match the temperature of my cold audience (is it concise and easy to consume)? Is it likely to make them want to buy from me in the future? Is this cold traffic lead magnet a stepping stone to my primary product or service? Is it building trust/ rapport with my cold audience? Is this aligned with that higher priced service/ product I could use to retarget this audience in the future? Wondering how to deliver your lead magnet? Advanced method: Upload your file to Dropbox/ AmazonS3, or your web host media library and link to it in an email from your connected email subscriber platform (ESP) or autoresponder.